I have quickly come to understand what I believe are the major areas one must concentrate on in order to be successful for the long term with a Paleo lifestyle. I’m not talking about specifics when it comes to what you eat, or how you eat, it’s more about behaviors and attitudes. Today’s post is the first of a multi-part series discussing these areas, and today we concentrate on cooking at home. Some of the biggest complaints I here from my patients about the Paleo lifestyle revolve around cooking. “I can’t cook like that,” or “I can’t cook at all” are what I often get. Being inLouisianapeople just can’t wrap their heads around coming out of the kitchen without biscuits, rice or potatoes playing a major role in dinner. The same is true for any regional cuisine and that cuisine’s traditional staples. It’s almost sacrilegious to tell people that Grandma’s famous dinner rolls gotta go! The Paleo lifestyle revolves around what goes in your mouth, and what goes in our mouths every night has to revolve around a home kitchen putting out the right kind of meals. Let’s talk restaurants. The first thing I suggest is to get over the idea that you can successfully convert to the paleo lifestyle by eating out every night. Although I do not instruct my patients to count calories when eating Paleo, I do think some obvious restraint is necessary. The average meal at a chain restaurant these days contains 400-750 calories for an appetizer, and 1200-1800 for a main course. These are averages, and many far exceed these numbers. Want to scare yourself more, take a look at the calorie numbers at common kid’s meals these days! Even splitting an appetizer, having an run of the mill entrée, along with a little bread and salad, you still are easily at 2000 calories on a good night. You simply can’t do this 4-5 nights a week and succeed. Another problem with restaurants is cost. I have absolutely no problem going to a very nice restaurant and spending a little money on a nice meal (in fact, I rather enjoy it!). That said, when one of the biggest issues patients complain about is the cost of eating Paleo, you have to be smart where you spend your money. A 16 oz Ribeye at a local steakhouse is 24-28 dollars, the same Ribeye is 12-14 dollars at my local butcher. Take this evening for example. I am cooking crabcakes with red pepper coconut sauce, roasted asparagus and a side salad. Here are some rough numbers on the cost. Now this is just an example, and I didn’t even give the kids crabcakes (which they love by the way). There is just no way anyone can argue that cooking at home is not immensely cheaper than eating out. The problem is many people don’t really see this because it just adds up. Ten bucks for lunch here, 50 for dinner there, and before you know it you have spent tons on dining out. I hear it all the time…”It’s just too expensive to cook at home!” Man! Get a calculator and discover the truth! Another area of concern with restaurants is that you have NO IDEA what they are cooking your food with. Did you know that a Wendy’s chicken sandwich actually contains some beef?! Even nicer restaurants are out for one thing (as they probably should be) and that is to make their food taste as good as they can so you will come back and eat again. They don’t do that, as well as turn a profit by cooking with natural oils or without cutting some nutritional corners. A major part of the Paleo lifestyle is being completely aware of what is going into your mouth. You can’t do that going out to eat unless you know who is cooking for you well, and you are able to given them specific instructions on what to do and what not to do. It can be done, you just have to be very proactive when you order and make them understand how important it is to you that things are done right. One last issue with eating out is that you are always prone to eat more when going out to dinner. Have you seen serving sizes these days! You go to a restaurant to eat, you are presented with a plethora of options, and given little extras to fill you up while you wait for your food to be cooked. How are we not going to overeat in these situations? How many of us when cooking at home serve an appetizer, bread, salad, main dish, and sides at every meal? When’s the last time your local Mexican joint failed to refill your chips and salsa on demand?! Enough about eating out, lets talk cooking at home for the rest of the post. I get it, I’m a foodie kitchen dork who loves to cook and make my family happy at meal time. I also have tons of time and don’t work but 3 hours a day….NOT!! Maybe you don’t like to cook? Or is it that you don’t feel comfortable in the kitchen? Or maybe nothing turns out as good as it does at Chilis? Here is a few suggestions. The first thing I suggest is that you keep a well stocked pantry at all times. 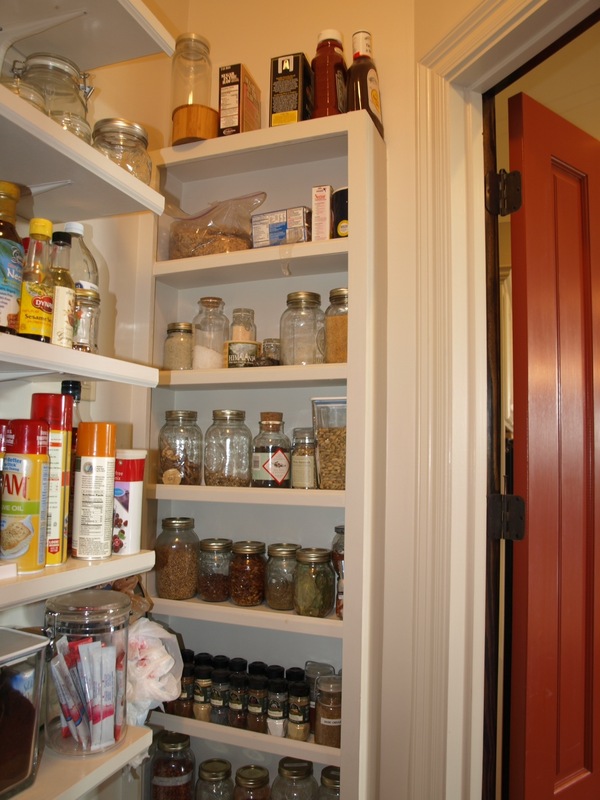 When we designed our new house I let my wife essentially do the whole thing…except for my pantry. I knew exactly what I wanted, and I even ended up having the builders rip a wall down and steal more space from an adjacent guest closet to increase the size. 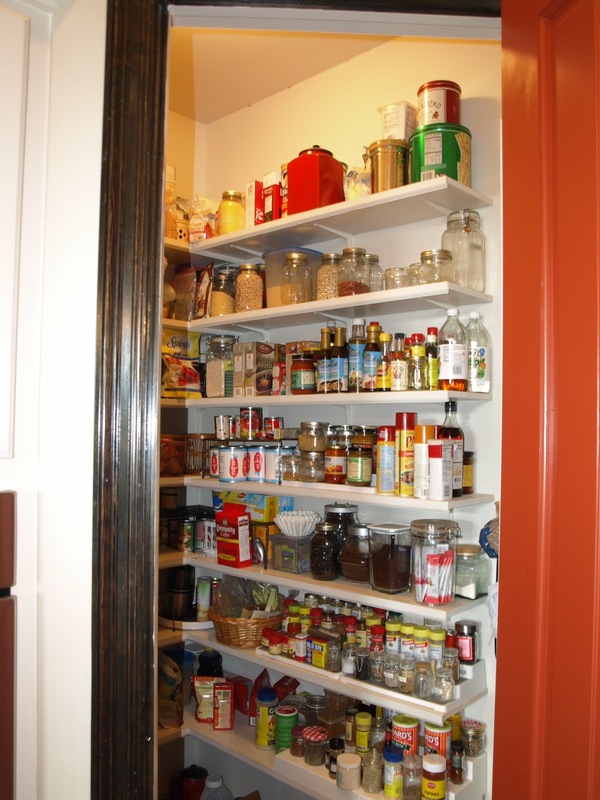 No matter the size though, you need to keep pantry staples on hand so you don’t have to constantly be running to the store to get everyday items. If you make it a priority to stock your pantry, you can spread the cost out over 3-4 months and end up with a good stock on hand. I can’t emphasize your pantry enough. Next I suggest you start easy and slow. Find some easy Paleo recipes on the internet or in a book and follow it step by step. Look here for a place to start! Read and understand the recipe well before starting, prepare your ingredients, and put it together. You just have to try! Don’t have much time, pull out the crock pot and take 10 minutes in the morning to fix dinner before you leave the house! This may sound obvious, but for a while I would stick to meals that you KNOW you and your family will love. If you are new to cooking, and your family is wishing Domino’s was delivering instead, the last thing you want is to try something a little out of the norm and (literally) leave a bad taste in their mouths. Cook some “fast balls down the middle of the plate” for a while to build your confidence, as well as the confidence of those you are cooking for. Once you feel pretty good about some easy recipes that everyone enjoys, start experimenting with new techniques and ingredients. Above all else, try to make cooking fun! Involve the kids and make a mess every once in a while. You are teaching your kids knowledge that will serve them a lifetime if they learn to produce great meals at home. Another MAJOR component to successful cooking from the home is planning. If I don’t have anything planned for dinner when I leave the house in the morning, we probably have a 75% chance of getting take out that night. We spend more, eat more, and likely are eating some things we should not. Plan ahead for 2-3 days and try to have your ingredients on hand. Check your family schedule every week and look for things that could get in your way. Always have church till later on Wednesdays? Why not try making Wednesdays crock pot night and you don’t have to worry about dinner other than to get home and serve. We usually do go out to lunch every Sunday after church, so it gives everyone something to look forward to on the weekend. Just find a schedule and plan that is right for you and stick to it. I want to give you guys two quick tips that I have discovered for myself over the years being the cook and planner in the house. First, I used to try to plan meals for the whole week on Sunday, and get everything bought early to cut on my trips to the grocery store. For me that just did not work very well. Almost always, what sounded good for dinner Thursday night when I was planning Sunday night did not sound as good when Thursday came around. This led to more going out to eat, and wasting of food I bought for that dinner if I did not quickly find another use for it. I now plan 2 days in advance maximum (unless I am using the Sous Vide for more than a 48 hour soak). I go to the store more, but it allows me to always keep what we eat fresh and more consistent with the moment. Second I want to talk cooking temperature. If you have ever watched Mario Batali cook on TV he says often that the difference between a home cook and a chef is in the “aggressiveness of the heat.” What he means is that restaurant food tastes so good because they cook with high eat and are not afraid to slightly burn food to get that umami flavor we all love. Be aggressive, but to be so you have to be there while your food cooks. My wife can’t do this because she tries to do too many things at once and can’t concentrate on just cooking. Not a bad thing, it’s just who she is! To cook with high heat and get great flavor you have to watch and be there for all the action. Work on this and your food will start tasting better immediately. I know this has been a sort of hodgepodge of thoughts, but cooking at home is absolutely essential to making Paleo fresh, affordable, and consistent in it’s results for you and your family. Make it fun for the whole family to find the best ingredients, visit local farmer’s markets, get to know the guy raising your beef if you can. If this is too much, maybe you can at least get to know the guy cutting your beef for you at the grocery store. One of my major goals as a dad and a cook is for my kids to know where food comes from. I don’t want them to think food comes though the car window, or from a box, or served mainly for us by a waiter at a restaurant. Real food comes from the home. And as I say; Real Food…Real Health. Great timing with this post! I have a few family members trying to go Paleo and it’s hard to know where to start.